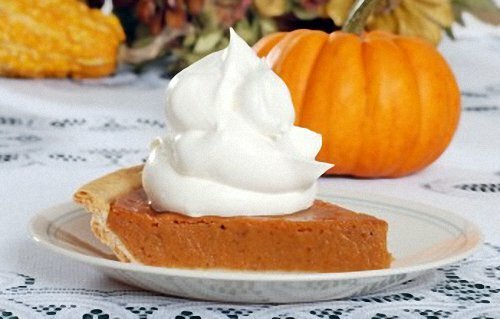 Grandma's favorite homemade pumpkin pie recipes will make delicious dessert pies that you'll be proud to serve on any occasion. Learn how to make pumpkin pies the old fashioned way, from scratch, and you'll never go back to using canned pumpkin fillings. And these pies are great for serving at any time of the year too, not just at Thanksgiving and Halloween. They are wonderful when served with whipped cream or vanilla ice cream. They're easily made and great tasting. So treat yourself today. Deep-colored pumpkins are generally the best. 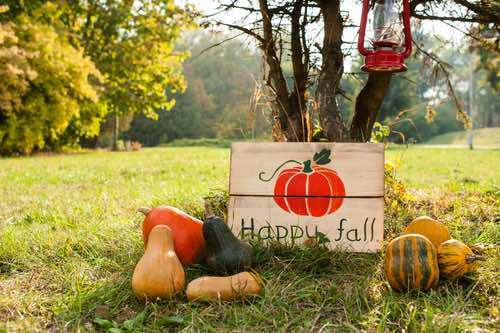 Cut a pumpkin or squash in half, take out the seeds, then cut it up in thick slices, pare the outside and cut again in small pieces. Put it into a large pot or saucepan with a vary little water; let it cook slowly until tender. Now, set the pot on the back of the stove, where it will not burn, and cook slowly, stirring often until the moisture is dried out and the pumpkin looks dark and red. It requires cooking a long time, at least half a day, to have it dry and rich. When cool enough, press through a colander. Cut up in several pieces, do not pare it; place them on baking tins and set them in the oven; bake slowly until soft, then take them out, scrape all the pumpkin from the shell, rub it through a colander. It will be fine and light and free from lumps. For three pies: One quart of milk, three cupfuls of stewed and strained pumpkin, one and one-half cupfuls of sugar, one-half cupful of molasses, the yolks and whites of four eggs beaten separately, a little salt, one tablespoonful each of ginger and cinnamon. Beat all together and bake with an under crust. Boston marrow or Hubbard squash may be substituted for pumpkin and are much preferred by many, as possessing a less strong flavor. One quart of stewed pumpkin pressed through a sieve, nine eggs, whites and yolks beaten separately, two scant quarts of milk, one teaspoonful of mace, one teaspoonful of cinnamon and the same of nutmeg, one and one-half cupfuls of white sugar, or very light brown. Beat all well together and bake in crust without cover. A tablespoonful of brandy is a great improvement to pumpkin or squash pies. One quart of properly stewed pumpkin pressed through a colander; to this add enough good, rich milk, sufficient to moisten it enough to fill two good-sized earthen pie plates, a teaspoonful of salt, half a cupful of molasses or brown sugar, a tablespoonful of ginger, one teaspoonful of cinnamon or nutmeg. Bake in a moderately slow oven three-quarters of an hour. Ruth H. Armstrong, in the Housekeeper, says: "If all housekeepers who make pumpkin pies knew how much better and easier it is to bake the pumpkin first, they would no longer worry over cutting up and peeling it, but just cut it in halves, take out the seeds, lay it in the oven and bake until soft, when it can be scraped out and used as usual, and is so much better for not having water in it. Winter squash makes a much richer pie when treated in the same way." Stewed pumpkin, 1 heaping pint; 6 eggs; flour, 6 tablespoonfuls; butter, size of an egg; sugar, 1-1/2 cups; cinnamon, 2 level teaspoonfuls; ginger, 1/2 teaspoonful; 1/2 a grated nutmeg. Directions: Rub the pumpkin through a colander, adding the butter, sugar, and spices, and make hot, then the beaten eggs and flour; mix smoothly together, and while hot put into the dish, having a thick crust to receive it, and bake in a moderate oven. — Henry Crane, Frost House, Eaton Rapids, Mich.
Stew a medium-sized crook-necked (or other equally rich) squash, and rub the soft part through a colander, as for the pumpkin pie recipe, above; butter, 1/2 lb; cream and milk, each 1 pint, or milk with the cream stirred in, 1 quart; sugar, 2 cups; 1 dozen eggs well beaten; salt, mace, nutmeg, and cinnamon, 1 teaspoonful each, or to taste. Cut a pumpkin into thin slices, and boil until tender in as little water as possible, watching carefully that it does not scorch; set the stew-kettle on top of stove, mash the pumpkin fine, heaping it against the sides of the kettle so that the water may drain from it and dry away; repeat this process until the water has all evaporated, and the pumpkin is quite dry. This will require from half an hour to an hour. Mash and rub through a sieve, adding, while warm, a good-sized lump of butter; to every quart of pumpkin, after it is mashed, add two quarts of milk and six eggs, the yolks and whites beaten separately, sugar to taste, one teaspoon salt, tablespoon ground cinnamon, one grated nutmeg, teaspoon ginger; bake in a hot oven until well set and a nice brown. The homemade pumpkin pie recipe above was donated to the Buckeye cookbook by the wife of William Irwin, the thirteenth Governor of California (1875-1880). Paper money was widely introduced during Irwin's term despite his fight to retain the use of gold and silver "hard money" in the State of California. Line a medium-sized pie-tin with pastry. Cover the crust thickly with thinly sliced, uncooked pumpkin, cut in inch lengths. Place on the pumpkin 1 tablespoonful of syrup molasses, 1 tablespoonful of vinegar, 1 tablespoonful flour, and sweeten with sugar to taste, dust over the top a little ground cinnamon, cloves, and nutmeg; cover pie with a top crust and bake in a moderately hot oven. Line a pie-tin, one holding 3 cups of liquid, with rich pastry. For the filling for pie, mix together the following: 1 cup of steamed pumpkin, which had been mashed through a colander, 1 egg, beaten separately, 1 tablespoonful of flour, 2-1/2 tablespoonfuls of sugar, 1/8 teaspoonful of salt, 1/2 teaspoonful of grated nutmeg, same of ginger, 1-1/2 cups of milk (scant measure). The mixture should measure exactly 3 cups, after adding milk. Pour this mixture into the pastry-lined pie-tin and bake in a moderate oven until top of pie is a rich brown. The best pumpkin for pie is of a deep orange yellow with a rough, warty surface. Remove the soft, spongy pulp and seeds of the pumpkin, pare and cut into small pieces. Steam until tender. Put in a colander to drain, then mash through colander with wooden potato masher. For one deep pie, allow one pint of the stewed pumpkin, beat in 2 eggs, one at a time, 1/2 teaspoonful salt, 1 teaspoonful ginger, 1/2 teaspoonful grated nutmeg, 1/2 teaspoonful cinnamon, 2/3 cup sugar, 1 scant pint milk. Beat all together. This mixture should barely fill a quart measure. Pour in a deep pie-tin lined with rich crust, grate nutmeg over the top of pie and bake from 45 to 50 minutes in a moderate oven. Have the oven rather hot when the pie is first put in to bake and then reduce the heat, else the filling in the pie will boil and become watery. If liked, two tablespoonfuls of brandy may be added to the mixture before filling the crust. In that case, use two tablespoonfuls less of milk. Preparing the pumpkin filling from scratch does require a little extra time and effort, but compared to the taste of canned pumpkin, the old fashioned taste of these pies is more than worth it. They taste so good! Some pie lovers swear that homemade squash pies taste even better than the pumpkin variety. You'll have to bake a couple and judge for yourself, but I know that I love eating them, and I'm sure will too. Try them. 1. 1/4 cup cinnamon, 4 teaspoons ginger, 2 teaspoons nutmeg. 2. 1/4 cup cinnamon, 1 tablespoon ginger, 1 tablespoon nutmeg, 1 tablespoon cloves.